Last week I laughingly told a couple of friends about a thought that had come to me, "I am the main character in every cheesy movie about a 55-year-old-plus divorcee or widow who went out to find herself...."
I've gained a deeper understanding of my faith. Dated a couple of wildly opposite guys. Figured out I can be happy and single at the same time. Changed my hair. Lost some weight. Started working out again. Traveled. Went paragliding. Found a love of live music. Started a really fun new hobby. And I even went to a paint night regardless of the fact that I can't draw a straight line with a ruler. The change has been gradual, and isn't finished... but I'm so much more confident in myself than I've ever been. I laughed when I shared it,"All that is left is for me to accept being single for the rest of my life and find a retirement home that will let me move in and paint sunflowers all day." It was mostly a joke. I wasn't retiring or painting or giving up on what I want for my future. I just thought it was funny. Mostly. But not completely. I didn't exactly like identifying with women 20+ years my age... even if they were just movie characters. It's funny how one comment can change your mindset. One friend surprised me by saying, "Well, you're way ahead. I was much older before I had that kind of confidence." My perspective of my "main character" status changed instantly. I'm not old before my time. I've been blessed with wisdom and confidence that many woman struggle to receive. I'm not ready to retire. I'm ready to live. In previous years I would have enjoyed praise and worship with Chris Tomlin, Michael W. Smith, and Cece Winans from my seat. This year I joined the pre-session dance party on Friday and then decided to join the women who were praising from right in front of the stage. It was a completely different worship experience. And guess what else... nobody thought I didn't belong up there with them. A few months ago I was afraid to go to a bar alone, even to meet friends for karaoke or see a band. I couldn't bring myself walk up to order at a crowded bar, knowing people would know I didn't belong there. The anxiety I felt over these things was ridiculous. I've gone to different places to see live bands several times now, and nobody has ever even given me a sideways look... much less questioned my right to be there. I've quickly come to realize that the thing that was most holding me back... was me. All of those times I was afraid to step out because of what someone might think, I was telling myself that I wasn't good enough. I wasn't smart enough, cool enough, funny enough, pretty enough, didn't have enough rhythm... didn't have whatever it was that I thought others had. I wasn't enough. Here's what I've had to ask myself: Who am I to think I'm not enough, when Someone already told me I am? God knows what I can do... so why should anyone else's opinion matter? How about you? What situations do you find yourself in that you slowly back away from because you know you aren't enough to be there? Where do you not bother to give your input? How often do you see someone doing something and think, "That looks fun. I wish I could do that!" Who are you to think you are not enough, when God already told you that you are? In Jeremiah 1:5, God told Jeremiah, "Before I formed you in the womb I knew you, And before you were born I consecrated you; I have appointed you a prophet to the nations." 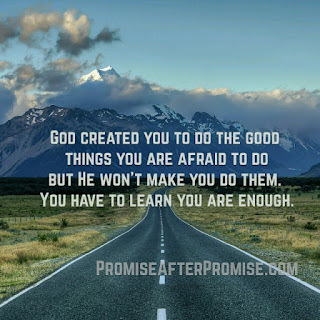 God's words to Jeremiah tell us that God knew we were enough before we were even born. The things we perceive about ourselves have nothing to do with our ability to carry out the plans God has for us. Keep reading Jeremiah and apply what God tells him to your life. You'll see that even when you don't have confidence in you, God does. 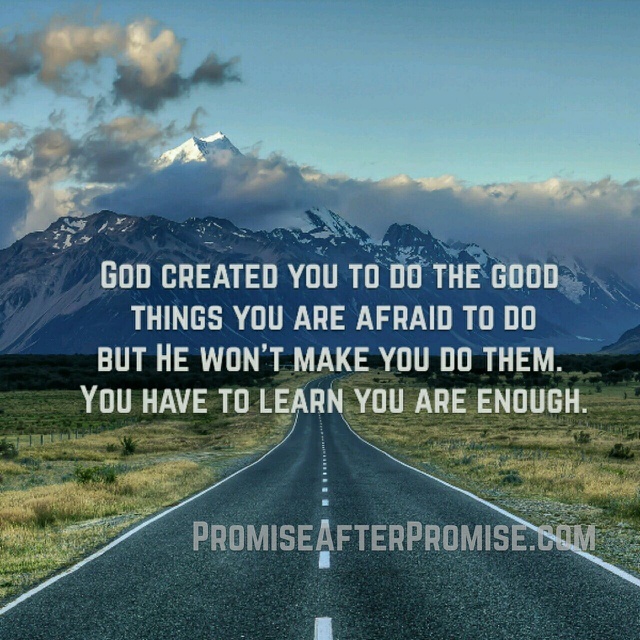 God created you to do those good things you are afraid to do, but He won't make you do them. It's the enemy that feeds you the lies that make you shrink back and give up those things you were destined to do. Talk to that stranger. Write that book. Sing that song. Start that company. Volunteer for that position. Hug that person who looks sad. Speak up for that person who needs someone to have their back. Take some time to take care of yourself. You'll still end up in Heaven if you don't ever learn this... but you'll enjoy your time on Earth a heck of a lot more if you do. You were created for this!